A new wiiw study concludes that Europe should respond to China’s New Silk Road initiative with its own coherent infrastructure network and transport strategy. The EU needs a coherent infrastructure network and transport strategy to leverage its economic potential. It should not rely on China’s Belt and Road Initiative (BRI) to achieve this, but invest itself to ensure that it suits European priorities. Moreover, a “European Silk Road” can be seen as complementary to China’s efforts. A new wiiw study finds that the development of a European Silk Road could create 2-7m new jobs, and could increase GDP on average by 3.5% in wider Europe over a ten-year period. Eastern Europe in particular needs an upgrading of its transport infrastructure. If this is achieved, the boost to incomes and living standards would be particularly significant in that part of the continent. China’s Belt and Road Initiative (BRI), the ‘New Silk Road’, is set to trigger billions of euros of investment in infrastructure and other areas. Beijing aims to build a new economic space between western China and Asian and African countries with an outreach to central Europe. The project has created significant expectations, including in Europe. However, the EU’s response has so far been a passive one. In a new study, wiiw tackles the question of where and how a ‘European Silk Road’ could be established, and what such an initiative could achieve. Our analysis shows that the European transport infrastructure needs renovating and modernising. A “European Silk Road” would be successful only if a common transport network is established consistently at all levels. This encompasses seaports, river ports and airports, and particularly the establishment of modern highways and advanced passenger trains with logistics centres. We estimate the costs for the full expansion of the infrastructure network at around EUR 1,000bn, or around 8% of the total GDP of all countries along the proposed routes (see below), or around 7% of EU GDP. The EU appears extremely reluctant to take such a step. However, this reservation is difficult to understand. The investment environment for large public infrastructure is ideal. Interest rates are close to zero. Debts financed investment could be self-sustaining. Alternatively, European taxes earmarked for common infrastructure investment could be raised. Also, hundreds of billions annually could be drawn from fighting tax evasion and avoidance on the EU level and used to invest in common infrastructure. We see enormous potential on various levels in Europe as a result of a “big push” in infrastructure investment. Our new study identifies the potential for an increase in GDP of 3.5% on average over an investment period of 10 years in the countries of wider Europe. At the same time, a ‘European Silk Road’ could create 2-7m new jobs, under favourable conditions and continuing low interest rates. Such an initiative would also strengthen economic integration and political cooperation. Apart from the economic potential within Europe, a ‘European Silk Road’ could also establish better connections with East Asia and link up to China’s New Silk Road. Apart from the positive employment effects, an expansion of the communication network would also lead to significant time savings. A better connection to the Russian central agglomeration could save over 8% of transport time on the road, representing a reduction of around 2.5 hours. Countries along a route through the north of Europe could increase their exports to Russia by more than 11%. This corresponds to additional exports of over EUR 12.5bn. Eastern Europe in particular is characterised by significant infrastructure gaps that need to be closed, including a lack of modern highways and advanced passenger trains, and income differences that need to be balanced. A ‘European Silk Road’ connecting the populous, but less developed east with the industrial centres of Western Europe would trigger economic growth and employment in the short, as well as in the medium and long term. Around 480m people live in Eastern Europe and the littoral states of the Black Sea and the Caspian Sea, almost as much as in the European Union itself (510m). However, the disposable income of people in the region is only around half of the EU level. This creates enormous market potential. Here, a “Big Push” in infrastructure investment makes the industrialisation of broad sectors of the economy more likely..
wiiw identified two possible main routes of a ‘European Silk Road’ connecting the west European industrial centres with the eastern part of the continent. In total, they encompass a route of 11,000 kilometres. Source: geoatlas.com, own route design. The proposed northern route runs from Lisbon to Uralsk on the Russian-Kazakh border. Central to this route are the links between the French industrial centre Lyon, the port of Duisburg, one of the most important logistics centres in the north west, and Moscow. 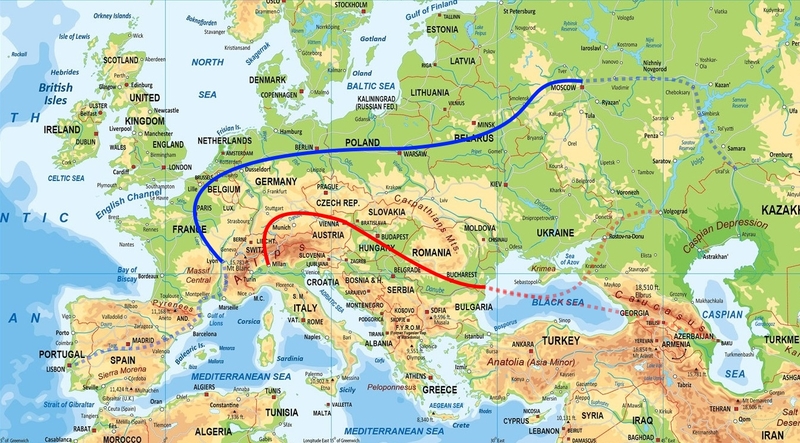 In the south west, expansions of that route lead from Lyon via Barcelona to Madrid and Lisbon and in the east from Moscow via Nizhny Novgorod and Samara to Uralsk. The southern route starts in the Milan region, the biggest Italian agglomeration and economic centre of the country. 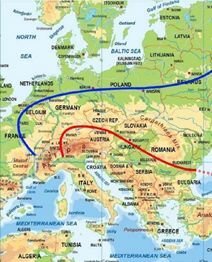 The route runs from Milan via Zurich and the highly industrialised regions of southern Germany along the Danube valley to Vienna, Budapest and Bucharest and further to the Black Sea port of Constanța. By sea, the Russian port of Novorossiysk and Volgograd can be reached, as well as the Georgian port of Poti, Tbilisi and Baku on the Caspian Sea.